In the wake of Saturday’s tragedy, I offer a special chapter of e-Torah rather than the usual consideration of the weekly portion. We’ll resume that endeavor next week. I am still choosing to focus on a song to inspire further reflection. Terrorists like the Pittsburgh shooter Robert Bowers feed on hatred. Their evil purpose is to murder and maim—and in so doing, to instill fear. They do not want us to feel safe in our synagogues and schools, and, alas, their malevolent intentions often bear fruit. As the old Yiddish saying goes, Shver tzu zein a Yid—it has always been hard to be a Jew. After this past Shabbat, it has gotten yet a little harder. As we wrote to you then, your CABI board and staff are listening and learning more about how we can minimize the risks and bolster our security while remaining the warm and welcoming congregation that we’ve long taken deep pride in being. At the same time, we should hold fast to Rebbe Nachman’s famous teaching. The world is a very narrow bridge—and it is our Jewish calling to resist the temptation to yield to the fear sown by evil men. As we say when we finish a book of Torah: Chazak, chazak v’nitchazek—Let us be strong and strengthen one another. Over the last couple days, I have found both comfort and courage in the song Narrow Bridge by Nefesh Mountain, the Jewish old time and bluegrass band fronted by Doni Zasloff and Eric Lindberg, who joined us at our Shabbat retreat in McCall just a few years ago. It is based on Rebbe Nachman’s wisdom, but transformed by Eric and Doni into a fully fleshed out journey from fear and loss toward hope and possibility. Troubled times, troubled times—just stay behind. My friends, in these troubled times let us walk that bridge together—for narrow though it may sometimes feel, it is wide enough to hold us all, if we walk together, with love and courage. After these things God tested Abraham, and said to him, "Abraham!" And he said, "Here am I.” God said, "Take your son, your only son Isaac, whom you love, and go to the land of Moriah, and offer him there as a burnt offering upon one of the mountains of which I shall tell you." At the end of this week’s portion, Vayera, we find one of the most challenging passages in the Torah: the Akedah, or binding (and near sacrifice) of Isaac. The Rabbis consider this the tenth and last of the trials God poses to Abraham, beginning with the call to leave home that opens last week’s portion, Lech Lechah. Indeed, the first and final trials serve as bookends, for each begins with the commandment, “Go!”—to Canaan in the former and then to the land of Moriah. So here we have two diametrically opposed readings of the text. In the first, Abraham is the heroic knight of faith; in the second, he is a zealot with a tragic misunderstanding, who should have challenged God. Leonard Cohen’s genius is that he manages, in good paradoxical fashion, to hold fast to both of these perspectives—and more—in his brilliant song, “You Want It Darker,” the title piece of his final record, released just days before he died. The album is shot through with mortality—a perfect context for wrestling with one of Torah’s darkest episodes. If you are the dealer, I’m out of the game. If you are the healer, it means I’m broken and lame. You want it darker—we kill the flame. Cohen sings over an ominous bass run, in a voice so deep and world-weary it shakes the earth—but the song ends with the plaintive repetition of the phrase by Gideon Zelermeyer, the cantor from the Montreal synagogue that Cohen’s family helped to found, backed by the congregation’s choir. It is heavenly and hellish at the same time. Just like the story in our parsha. For this year’s e-Torah, I will be looking at each week’s portion through the lens of a song. The music will serve as a kind of midrash, a commentary on the sacred words. God said to Abram, “Go forth from your native land and your father’s house to the land that I will show you. . .” Abram was seventy-five years old when he left Haran. Abram took his wife, Sarai, and his brother’s son, Lot. . . and they set out for the land of Canaan. Abraham—and Sarah—set out on what proves to be a lengthy and arduous course of voyages. Their travels take them through a series of hardships that the Talmudic sages describe as the Ten Trials, beginning with this command to forsake their ancestral home. Ensuing challenges include famine, war, physical and emotional trauma, the expulsion of Hagar and Ishmael and, ultimately, the binding of Isaac on the sacrificial altar. Sometimes Abraham and Sarah face these trials with grace and wisdom, while at other times they stumble and fail. But in the end, their journey—which lasts their lifetimes—proves to be transformative. Their travels—successes and failures alike—re-make them from Mesopotamian shepherds into the father and mother of the Jewish people. And so we ramble through the briars and brambles, back and forth between victories and defeats, , and somehow emerge anew. To be a Jew—a child of Abraham and Sarah—is to be born to wander and to wonder. God gave Noah the rainbow sign: No more water but the fire next time. (. . . they came on in two-sies, two-sies, elephants and kangaroo-sies). This has always struck me as odd, for the Flood narrative is the most brutal tale in the entire Hebrew Bible. The plot is pretty simple: God destroys every living thing except for Noah’s family and the creatures they’ve gathered in the ark. Genocide is hardly child’s play. Of course the hopeful note in this otherwise brutal story comes at the end, when God promises never to flood the earth again. We arrive at that passage and breathe a sigh of relief, thinking, “Well, that was horrible, but thank God, we’re safe.” But are we? Midrash teaches that as Abraham witnessed the fiery destruction of Sodom and Gomorrah, he confronted God: “You promised never again to destroy the world in a deluge. Surely You did not mean that you might still send a flood fire?” And God was silent. 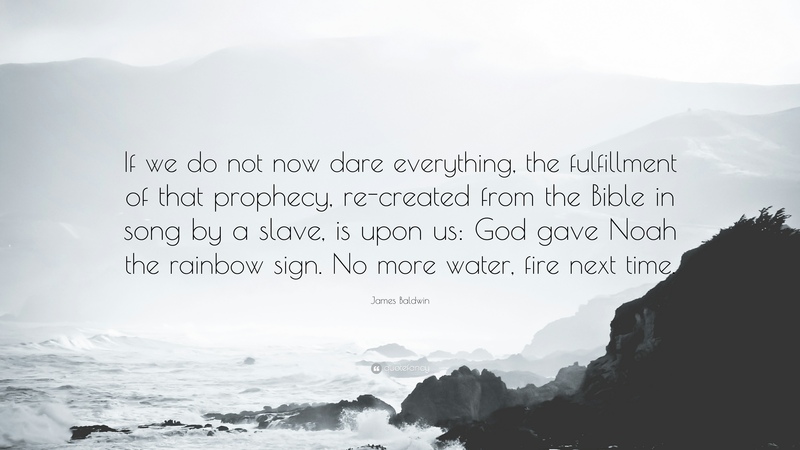 Or, as the old southern spiritual puts it: God gave Noah the rainbow sign: No more water but the fire next time. The fire next time—the words of the spiritual and James Baldwin’s elaboration of them echo, for me, the portentous language of Unetaneh Tokef, which we read last month for Rosh Hashanah and Yom Kippur: Who by fire and who by water? We Jews, too, recall the Flood’s devastation, and the terrifying possibility of a repeat occurrence, by way of conflagration rather than deluge—not to cow us into submission but, rather, to turn our hearts and hands to the work of tefillah, teshuvah, and tzedakah—spiritual renewal, repentance, and liberation. In a world ablaze with injustice, on an earth where rising temperatures are melting polar ice caps, spawning massive storms, and unleashing wildfires across our own region, let us listen and learn from the Noah story. These times cry out for both its warning and its hope. With courage and persistence, we might yet avert the fire next time.